Once upon a time our satellite cable provider (who is just awful) sent us a faulty replacement cable box the day before the Breaking Bad series finale and we didn't get to watch it and had to stream it from some broken-English website the next day. That is my Breaking Bad story for you. 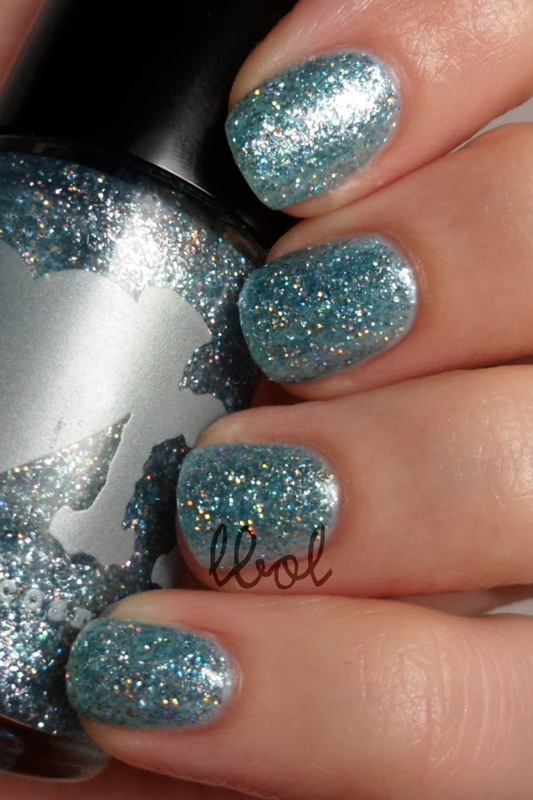 Heisenberg, anyway, is an ice blue fleck-filled polish with tiny holographic glitter. I purchased my bottle second-hand and it was remarkably thick so I did thin it down a bit. From the reviews I'd read, there wasn't anything about the formula being thick so I think it might have just been a result of having been used several times before I got a hold of it. As it was a LE polish from August of 2013, I didn't much care about use. I just wanted it, you know? Sooooo sparkly! The polish can be worn without a base color is how dense it is, but it would probably take another layer or two for opacity. I think Pretty-Ugly was a good base for this polish; similar enough in color but not too dark or too bright so that it doesn't overpower the two thin coats of Heisenberg. I'm really glad I found somebody who wanted to part with this!